This latest release by Howard Hersh reveals more of his range as a composer. His previous release focused on one large concerted work for piano and chamber orchestra as well as some virtuosic writing for piano and for harpsichord. This disc (worth a listen if only for the return engagement of the pianism of Brenda Tom) focuses on some smaller chamber ensembles and a look at the composer’s more impressionistic moods. This writer is left with the notion that each piece seems to be an intimate telling of a story. Though the stories are not explicit, each piece has a distinct narrative character. Mary Rowell handles the multi-track violin parts on Madam’s Tavern (2014). The piece has an almost symphonic character evoking a variety of styles and meandering most pleasantly through a musical narrative whose details are not as important as the fact that the piece engages very successfully on a purely musical level. It is written for solo violin with a chorus of some 15 tracks of violin accompanying. Loop (2006) is a sort of cyclic quasi-minimalist work featuring Jonah Kim on cello, Brenda Tom (gently) on piano, and Patricia Niemi on vibraphone. It is a dream-like, perhaps even impressionistic piece whose structure and compositional techniques serve the end goal of being a charming aural object. I Love You Billy Danger (2012) was written for pianist Brenda Tom. Here she demonstrates her virtuosity and her dramatic and dynamic range in a piece which, though related to Liszt according to the liner notes, seems to evoke the rather Lisztian master Frederic Rzewski as well. Tom is at her fines with this challenging work and she conveys the narrative well. Night (2013) seems related to the earlier Loop by virtue of being a percussion piece but also by its gentle evocation of a shimmering musical narrative punctuated with a clarinet part that alternately hides within the percussive sounds and comes wailing out in jazzy/bluesy moments. This writer was left with the notion of Gershwin haunting the score (but maybe that is because this review is being written in the Halloween season). José González Granero is on clarinet, Patricia Niemi on marimba, and Nick Matthiessen on percussion. Dancing at the Pink House (2006) is a musical narrative for clarinet and piano that Hersh has featured as a teaser on his website. It was written for Patricia Shands, clarinet and is accompanied by James Winn on piano. Shands is the owner of said Pink House and she seems to be having a lot of fun with this playful but substantial piece. Both of these musicians appeared on Hersh’s 2007 CD release, Pony Concerto (Albany Records). Dancing at the Pink House is a valuable addition to Hersh’s discography and reveals more of his range as a composer. This is a highly entertaining recording and leaves the listener wanting more. Suicide, the artificial ending to a life is an inscrutable act, especially so when it takes the life of a talented individual. So it is with Austrian composer Gerhard Schedl whose life was ended by his own hand in 2001. I had never heard of this man and his work and I always welcome the opportunity to hear music new to my ears and such an opportunity presented itself recently. 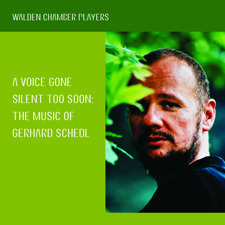 By good fortune and the kindness of cellist and current artistic director Ashima Scripp I received a copy of the Walden Chamber Players latest CD: ‘A Voice Gone Silent too Soon: The Music of Gerhard Schedl. The disc contains 4 chamber works for various combinations of strings, piano and clarinet. As it happens I had not been familiar with this ensemble before either so a word about them would seem to be appropriate. Founded in 1997 this flexible sized ensemble consists of eleven musicians including strings, piano, harp and woodwinds. The musicians are all highly accomplished and most are on faculty at area Universities. Their choice of repertoire distinguishes them as they seem to choose new and/or lesser known music that the musicians feel deserve a hearing and hopefully a wider audience. Their fascinating catalog at the time of this writing consists of 6 discs and includes music by Beethoven, Debussy, Vaughn Williams, Francaix, Gubaidulina and Reger to name a few. When they choose Beethoven they choose the seldom played string trios and their other choices seem to involve late romantic and early 20th Century composers with a focus on pieces that are little known and rarely played. From what I have heard they bring a real passion to their performances. In addition they have a variety of educational and outreach programs that serve to increase interest in chamber music and support new artists in playing this repertoire. Now to the disc at hand. At first I did what I usually do after a quick read of the liner notes. I put the CD in my car stereo to begin some relatively casual listening so I can begin to form some initial impressions. However this is music of wide dynamic range and some of the most beautiful moments are the quieter ones so I found that it is best heard in a quiet environment and preferably with headphones. Most of the gestures in this music are the familiar sounds of chamber music. The music is sometimes melodic, sometimes pointillistic, sometimes impressionistic, sometimes expressionistic. Schedl seems to be a sort of modern post-romantic who is well-schooled in what a chamber ensemble can do and is apparently influenced by the expressionism of Schoenberg and the Second Viennese School as well as by Mahler, Debussy and perhaps Messiaen. This being said his music does not actually resemble any of these influences too strongly. The music is rarely dissonant but there are grand fortissimo gestures as well as glissandi and what sounds like some playing inside the piano and some extended techniques which my ears could not identify with certainty. But this is not what I would call “experimental music”. Indeed the music sounds very well planned with an ear for subtleties that the ensemble lovingly interprets. It sounds like this music is as enjoyable to play as it is to hear. Though virtuosic it is also expressive if agonized at times and the recording is fantastic. The first piece, String Trio (1991) for violin, viola and cello is in three movements. I did not find the tempi descriptions particularly useful as a listener since this composer’s music seems to sustain a variety of tempi and expression within each movement. Inevitably comparisons to Schoenberg, Webern and perhaps Ernst Krenek will come to mind and it is difficult to predict this piece to stand with those models but it definitely bears additional hearings and would be welcome on any good chamber music program. The next piece, “A Due”, a Duo for Violin and Cello (2000) is from the last year of the composer’s life. It is in four movements and is the most angst ridden of the pieces on the disc. This combination of instruments is relatively rare. I personally know only the Ravel duo which resembles this piece though that is largely due to the instrumentation, not the style. This is a concentrated and deeply felt piece which seems to reflect some painful emotions. Here I am reminded more of Webern and perhaps Wolfgang Rihm with their spare textures and emphatic fortissimi amidst the quieter moments. As with all the pieces on this disc the execution reflects the intense concentration and dedication of the musicians. The five movement, “A Tre” for clarinet, violin and piano of 1984 is the earliest composition here. It comes as a welcome relief emotionally from the previous “A Due”. This is by far the most whimsical of the pieces featured on this album. It has an almost orchestral feel to it at times. Multiple techniques (and, no doubt, careful execution) result in textures that are sometimes rather expansive. Shades of Messiaen appear to be present sometimes. They contrast with the more chamber music like gestures familiar from the previous works. The disc concludes with the 1996-7 “A Cinque” for clarinet, violin, viola, cello and piano. It is a very serious post-romantic, even neo-classical take on the quintet format. The piece consists of three movements. The first two are serious but not terribly dark and showcase the ensemble well. The last, an adagio, has a sadness mixed with nostalgia that reminds this listener of Mahler. There are none of the abrupt dynamic changes heard in the previous works on this CD, only a soft and gentle ending. If you enjoy well-performed and recorded chamber music and are interested in exploring something besides the old war horses of the standard repertoire then this disc is for you. Multiple listenings reveal more detail about the pieces and make this writer curious about this man’s work for larger ensembles as well. Thank you Walden Chamber Players for a wonderful CD. I look forward to hearing more from this fine and adventurous ensemble.